That working-class anger and resentment helped propel Donald Trump to the presidency is well known. This discontent points to important questions omitted in current political debates, beyond discussions about job loss to foreign competitors and technology: What is the place of work in a good life? And how should a society honor work? Neither party has been able to offer a compelling answer to these questions, or even to raise them. Their failure to do so has contributed to working-class support for Trump. The anger with establishment politics that Trump seized upon is not only about job insecurity but a growing sense that traditional blue-collar work is no longer honored as it used to be. If the status and dignity of work looms so large in contemporary life, then why do the major political parties seem incapable of addressing it? The reason, I suggest, is that we do not adequately appreciate work as a distinctive aspect of life. We think of work mainly as a source of income and material well-being rather than as a source of identity and social esteem. And yet, paradoxically, we allow the realm of work to infiltrate every aspect of our lives. Digital devices tether us to the workplace in every waking hour. And we find it difficult to disentangle family life from the seemingly ubiquitous demands of our job. What is needed is a way of appreciating the distinctiveness of work and the way it contributes to our identities, while at the same time figuring out a way to keep work in its place. To think through how we might accord greater social recognition to work and at the same time prevent it from colonizing other aspects of our lives, I propose that we consider a neglected but highly relevant source: the philosophy of Georg Wilhelm Friedrich Hegel. Though Hegel is well known for his highly abstract philosophical works, he wrote with great care about the new relationship between work, family life, and politics that was emerging in the rapidly expanding economy of the nineteenth century. More so than thinkers in earlier ages, who wrote in a social context of agricultural work and aristocratic leisure, Hegel had the opportunity to address the meaning of labor. The white-collar workers and politicians of today often misunderstand the importance of blue-collar work for those who have it. Revisiting the elements of Hegel’s account is a crucial prelude to sound policy thinking. To understand the social roles played by work, we need to recognize the relation of the economy to social life as a whole. These days we assume, following Adam Smith, that the purpose of an economy is primarily to generate income and wealth. Our public policy discussions on the economy tend to center on what will make for a “bigger pie,” improve “efficiency,” or increase GDP. Hegel, however, interprets the economy in very different terms. For Hegel, the economy is not only a mode of production but also a place of recognition. In the economy or “civil society,” as Hegel calls it, social esteem depends not on family or religious affiliation but on the ability to provide a particular good or service. If I am talented at cutting hair or playing basketball, for example, my customers or fans will accord me respect quite apart from the social class into which I was born. In modern societies, market participants are able to choose their career paths according to their interests and talents, and to gain recognition for doing so. Recognition is reflected in the wage or payment for a job well done. The freedom to develop one’s interests and talents is the fulfillment of individuality. It means striking out on one’s own, making a name for oneself, and not simply inheriting a title. But such freedom, as Hegel sees it, is not sufficient on its own. It depends for its full realization on another, contrasting realm of life in which the individual belongs simply as a member: that of the family. Unlike the economy, in which recognition is based on particular interests and abilities, the family is the sphere of “immediate unity” based on love. One attains recognition in the family “not as an individual but as a member,” which is why we speak of our family members first, their accomplishments second. In a well-ordered family, members love and care for each other unconditionally, in a way unmediated by particular interests and talents. They certainly still appreciate each other for particular qualities and skills. But such appreciation is not the primary basis of their recognition. Family members commit to each other and stick together regardless of their career aspirations and accomplishments. Hegel sees in such loyalty a kind of freedom that contrasts with the individuality of the marketplace. Unlike a producer or a consumer, who is limited by the various other professions in society and what they provide, a family member enjoys, within the family, the freedom of being unlimited by anything external or alien. Even in moments of disagreement, family members view their own good as bound up with the good of the whole. The shared freedom of the family provides a contrast to the individual self-direction that prevails within the economy. The special significance of the marketplace, of particularity and distinction, emerges only in relation to a community in which esteem is undifferentiated. The family and civil society thus, for Hegel, form a pair. Unconditional family love, and civil recognition based on merit, immediate family unity, and individual self-expression in society. He suggests that you cannot fully enjoy one without the other. But this pair of institutions, and the distinctive form of recognition that prevails within each, depends for Hegel on a third: political society or the state. Today we tend to think of the state as an impersonal power necessary to provide defense and to enforce property rights. Liberals would add that it should provide a safety net for the poor. Hegel recognizes all of these familiar functions. He devotes special attention to the predicament of those who lack the particular skills rewarded in civil society at any given moment. The state, he thinks, should provide for the poor so that inequalities do not grow too vast. But he thinks the state is about something more than any of these important functions. The ultimate purpose of the state is to remedy a certain deficiency in the kind of freedom that a market-oriented civil society provides. In civil society, individuals win distinction as parts of an elaborate system of interconnected vocations. In doing so, they achieve independence vis-à-vis the family. But with respect to each other, they are bound in relationships of dependence. Consider a small business owner, such as the owner of a coffee shop. His ability to win distinction as a producer of fine coffee depends on a multitude of factors not entirely within his control. He depends on the landlord from whom he rents the space, the roaster who supplies the beans, the manufacturers who make the trucks that ship the beans across country. These other members of civil society on whom the owner of the shop depends are “others” in a sense that is remote, impersonal, and even alien. In a vast economy with a highly developed division of labor, the owner of the shop has probably never met or even spoken to many of his suppliers. If the shop owner or anyone in civil society is to be fully free and independent, he must come to understand the distant, unknown others on whom he depends as equal participants in a common way of life that transcends particular needs and desires. To promote such understanding—a sense of the common good, of the identity of each with all—is the true purpose of political society. The notion of the state as embodying the common good hearkens back to Jean-Jacques Rousseau, a figure who had great influence on Hegel and whose notion of the general will in contrast to the particular interest finds expression in French republicanism today. But Hegel disagrees with Rousseau in one crucial respect. Whereas Rousseau believes that the common good or general will finds expression only when citizens set aside their particular interests, Hegel believes that such an ideal is a misguided abstraction. The common good, and the sense of patriotism that sustains it, can be achieved only by integrating particular interests within a body that deals with matters of common concern. Hegel’s notion of the integration of civil society and the state leads him to propose a peculiar but very interesting mode of representation in the legislature, the main institution of the state. Representation, according to Hegel, must be by profession. For example, the association or guild of lawyers nominates its representative to the legislature. The guild of doctors does the same. So too the guild of brewers, butchers, and bakers. In Hegel’s state, each profession has public status as a corporation that nominates its own member to the parliament. While such a proposal was raised and rejected during the constitutional debates of the American founding, the fundamental question has returned. Hegel’s basic point is that the concrete way in which individuals win distinction as members of the economy should be the basis for their participation in the common good. Rather than do away with all partial associations at the level of the state (which was Rousseau’s solution and still the model for contemporary French republicanism), Hegel’s state gives them equal recognition. In contemporary terms, a system that accords a representative role to all elements of civil society, not just powerful ones such as Wall Street and big business, could relieve the problem of state capture by special interests. By acknowledging all guilds, vocations, and professions, the state enables them to transcend their purely individual, self-interested character. By bringing representatives of each profession face to face for the purpose of deliberating on matters of public concern, they come to know and respect each other as distinctive parts of the common good. The state can thus be seen to recapture a kind of family spirit at the level of society as a whole, but in a way that preserves rather than dissolves the differences of civil society. Hegel’s picture of the free society, especially his notion of nomination to the legislature by profession, is rather distant from our model of representative government. Its distance, however, sheds some light on what has gone wrong with our social and political life. The problem that we face today can be described in the following way: the American economy has colonized the state on the one hand and the family on the other. By encroaching upon the very spheres of life in contrast to which it attains its distinctive dignity, the economy has itself become corrupt. Members of the economy are increasingly unable to understand themselves as providing for a family and as cultivating a particular skill that contributes to the common good. They instead understand themselves as embroiled in a competitive race to an ever-receding pinnacle of success and, at the same time, as stuck in the vicious cycle of consumption and emptiness. The market’s colonization of the state is most evident in the influence of big money and special interests on politics. Virtually unlimited corporate campaign contributions and lobbying limit the possibility of and distort individual or local political expression. The role of large financial, energy, or pharmaceutical companies in influencing legislation and government regulations is perhaps the most obvious example of this trend. It has become evident to many American voters that the government represents a few prominent economic interests and not others. Far from the Hegelian vision in which the state gives public recognition to all professions as parts of a whole, the contemporary state serves some at the expense of others. But there is a subtler sense in which the economy and the state have merged to the detriment of both, a sense reflected in the narrow ideology of establishment politics on the right and left. One could call it the ideal of meritocracy, or “fair equality of opportunity”: eliminate barriers to success such as dire poverty, as well as prejudices based on race, religion and gender, and then let the free market operate unimpeded. In different forms, this has been the core message of mainstream politics on the left and right. Their differences are not to do with the meritocratic ideal itself but on how to achieve it. Whereas the Left emphasizes a stronger safety net for the poor, the Right emphasizes unfettered free enterprise. But both versions have failed to resonate with the electorate. Hegel would not be surprised. Although eliminating unfairness and overcoming bigotry are worthy goals, they are worthy for the sake of a purpose higher than optimizing market interactions: to embody a common good that gives public recognition to the variety of professions and their contributions. In Hegel’s terms, when the state acts to regulate the economy, to mitigate inequalities and provide for the poor, or when it acts to maximize GDP and to encourage consumption, the state is acting merely as an extension of the marketplace rather than as a site of shared enterprise. In today’s landscape, political leaders on both sides of the aisle have presented themselves as conscientious custodians of the economy but have failed to speak to the common good. Instead of calling upon Americans from different professions to recognize their common identity through the distinctive jobs they perform, each of which contributes to the common good, they have vowed to help people “get ahead” and “go as high and as far as their God-given abilities and hard work will take them.” But one might ask: why is “getting ahead” so important? And why the need to keep climbing? Why not be satisfied with a job that actually produces something concrete and worthwhile as a social good, however great or small? Restless striving has been part of the American character since the time of Alexis de Tocqueville, at least. That makes it all the more important to orient our way of speaking toward the common good. “Getting ahead” will always be with us, but we can moderate the impulse behind it by renewing the way we speak about the dignity of all work. Let us assume for a moment that a working-class job, say with Carrier Air Conditioner, could provide for a comfortable life—enough for a family, a house, a car, and some leisure time. The activity of producing a good and useful product might be more satisfying than aspiring to a more remunerative, high-flying job in derivatives trading, which (however unobjectionable it might be) makes no obvious contribution to the common good. Absent from mainstream political rhetoric has been an attempt to recognize and honor the substantive merit of making and building things of concrete use to our fellow citizens. The promise to bring everyone to the same starting line of a race to go “as high and as far” can be as patronizing as it is unrealistic. It implicitly degrades blue-collar work from the perspective of the supposedly better occupations of the professional class. But market activity has not only encroached upon politics. It has also permeated the family. That dire economic necessity can put pressure on family ties is a given. When mothers and fathers are working long and exhausting hours to make ends meet, they have less time to spend with their children and with each other. Equally disconcerting but less recognized is the sense in which the family is eroding in a different way among the middle and upper classes. Increasingly, the family is losing its distinctive character as a sphere of “immediate unity” in which interests, talents, and achievements are meant to be secondary to unconditional love. Such erosion finds striking expression in “helicopter parenting,” the way in which mothers and fathers anxiously hover over nearly every aspect of their children’s lives, especially those pertaining to achievement in civil society. Helicopter parenting amounts to an obsession with career success, distorting legitimate career goals in law, medicine, business, politics, and NGO work by making them the ultimate token of a life well lived. Parents should guide their children toward a range of career paths that will enable them to support themselves and a family of their own, and also instill in them certain virtues of character that transcend the workplace—friendship, generosity, family loyalty, self-respect, and being kind without being a pushover. Instead many parents frenetically monitor their children to make sure they are poised to get into the eighth-grade math league at age ten, or ready to try out for varsity baseball as freshmen. They demand rigid practice schedules, berate their children for poor performance and offer various incentives for achievement. Recognition in such families is based on the achievement of particular tasks paving the way to the Ivy Leagues. The home, whose purpose is to provide a contrast to the modern economy, has become increasingly colonized by it. As the children of helicopter parents graduate from college, enter the workforce, and start families of their own, they retain aspirations for loving spouses and adorable children. But when their own upbringing prioritizes career over the “immediate unity” in which family love consists, they are left with a corrupted vision of the ideal pair: that of the “power couple.” Some express the vision in the blunt formulations of having an “ambitious and successful” spouse who “works hard” and who will “support me in my career goals.” Others express the vision in much nobler but just as career-oriented formulations: in terms of the desire for someone who “wants to do good in the world,” or who “shares my political ideals.” Such qualities in a husband or wife, though worthy as aspirations for action in civil society, should be as irrelevant to family solidarity as making piles of money in hedge fund management. From the perspective of the corruption of family unity, it is all the same. The notions of loyalty, commitment to each other because we are family (quite apart from what we do for work), and devotion to children (quite apart from what they do), is giving way to the résumé conception of the good spouse. To be sure, many otherwise career-oriented people still valorize unconditional love. But the way in which spouses relate to each other and their children has been widely distorted by market influences. That many families refused to unite for the holidays in the wake of the 2016 election illustrates the stresses on the notion of family as much it does the divisiveness of our politics. From Hegel’s perspective, placing such demands on work is a mistake. Life-purpose, Hegel suggests, inheres not in one’s job but in the balance among complementary spheres of life—among the various professions that constitute the economy and, more broadly, in the relations of the economy to the family and to the state. Work that is genuinely meaningful, according to Hegel, is so for two reasons: (1) it supports a family, and (2) it allows for the development of a particular talent that contributes to the common good, and for which one is publicly recognized. Without the family and a supportive political environment, however, a job well done loses much of its dignity. Participants in the economy need to be related to institutions that represent the common good, sheltered by the guarantee of unconditional love within the family. When they are left on their own, they find themselves awash in a complex and impersonal system of the division of labor and trade, within which they must try to gain some control. The pressures of landlords, remote suppliers, other industries, and fickle consumer preferences constantly threaten to put people out of business. In this situation, the pressure to master one’s circumstances grows more intense. Bosses seek security by turning as much profit as possible through cutting costs, abusing labor, and often supplying a lesser product that customers can somehow be persuaded to accept. Where the family and state are robust, the desire for profit is circumscribed by the goal of supporting a family, as well as by the goal of contributing to the common good. When the family and the state begin to atrophy, the desire for profit has nothing to contain or direct it. What emerges in place of a society of mutual recognition is a system of competition governed by wholly utilitarian norms. What might be done to mitigate the social and political crisis into which we are falling and to restore the dignity of work? President Trump’s pandering to the working class and recent coup with Carrier to save some one thousand jobs fall woefully short of reversing the crisis that prepared his ascent to the presidency. Better, more resonant rhetoric that speaks to the distinctive contribution of different professions to the common good would be a start. Beyond rhetoric, a range of more far-reaching institutional reforms might be considered for empowering all professions and not just a few special interests. One modest step toward the direction of Hegel’s state would be to have workers from a range of industries represented in trade negotiations. Part of what animated popular outrage against TPP, after all, was that its terms were negotiated behind closed doors, by economic “experts” with representatives of only the largest companies and financial interests whispering in their ears. The goal of such a reform would be not only to make trade deals fair, that is, representative of labor and not only management, but also to give public recognition to work of different kinds, including manufacturing, as essential to the common good. A more radical Hegelian reform, admittedly difficult to achieve constitutionally—but worth considering if only as a thought experiment—would be to reorganize House representation around profession rather than state or district. Each profession would have legal status as an association, or union, which would nominate a designated number of representatives to Congress. How exactly to define the professions and vocations for this purpose would of course need to be worked out. So too would be the designation of seats allocated to each profession and the degree of autonomy of each profession to define its own rules of election, and to register new members. But these problems are no more vexing than the ones that arise already in our current system of representation by geographic district: How are the districts drawn up? What role does the federal government have in determining electoral rules of the states? Is voting accessible to all members of all districts? How do we prevent legislatures dominated by one party from drawing districts in favor of their own candidates? And so on. Although representation by profession would introduce new challenges to our electoral system, it would also simplify it in many ways. The circumstances of the professions have changed significantly since Alexander Hamilton rejected the anti-Federalist proposal for a similar model in Federalist No. 35. “Mechanics and manufacturers,” he argued, “will always be inclined with few exceptions to give their votes to merchants in preference to persons of their own professions or trades…. They know that the merchant is their natural patron and friend; and they are aware that however great the confidence they may justly feel in their own good sense, their interests can be more effectually promoted by the merchant than by themselves.” While this argument worked when merchants and manufacturers together were involved in building America’s productive capacity, today that calculus does not hold in the same way. The interests of labor and management have diverged more sharply. Merchants may be indifferent to the location of production, and manufacturers themselves have spent decades shifting their production to cheaper labor sources overseas. Even if the anti-Federalist or Hegelian proposals would be too difficult to implement currently, the point remains. A disconnect between the professions and their political representation has grown due to changes in the structure of economic production. The principle behind this proposal matters more than any actual implementation of it. As in the case of including workers in trade negotiations, the goal of such a reform would be not only fair representation of all economic interests in policymaking, but public recognition for each profession as an integral part of American society. Such recognition would encourage members of the economy to respect each other as parts of a differentiated whole, each giving shape to, or making possible, the others. The hope would be for such recognition to encourage a sense of social responsibility, a sense of working not simply for profit, but to provide a particular good or service that helps sustain a way of life worth affirming. It would also mitigate the toxic work-driven pressures that, in different ways, now constitute an assault on family life from the working class to the upper-middle-class. In a nation as culturally and religiously diverse as the United States, shaped by waves of immigration, and founded on ideals rather than common heritage, finding a basis for solidarity is no easy task. But the absence of typical sources of shared identity makes the U.S. uniquely open to a Hegelian approach to robust citizenship. Mutual recognition through work—and an understanding of how our different professions complement rather than undermine each other—may be the most realistic hope for a common good. 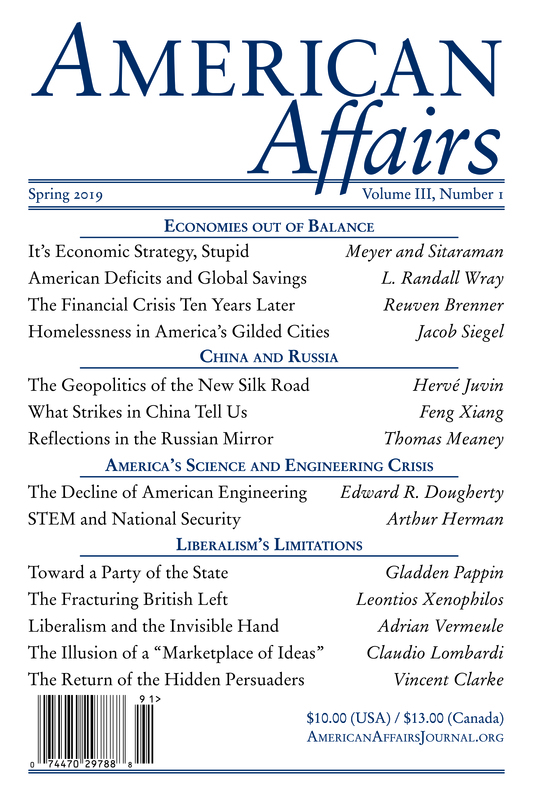 This article originally appeared in American Affairs Volume I, Number 1 (Spring 2017): 152–62. Adam Adatto Sandel is the author of The Place of Prejudice: A Case for Reasoning within the World (Harvard University Press, 2014).